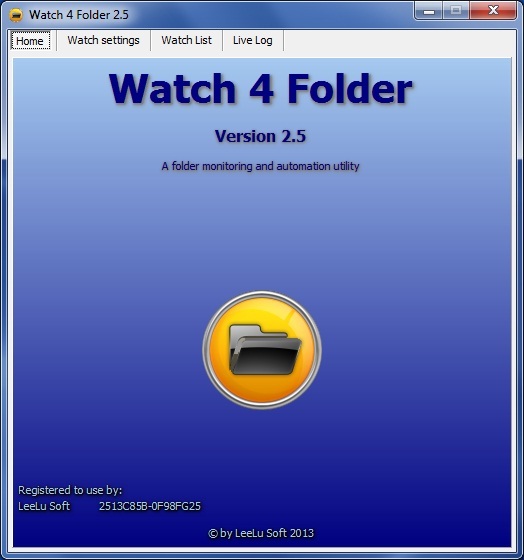 Watch 4 Folder 2.5 is a powerful monitoring and automation tool to monitor folders and files activities. It is a small, portable (registered version only) and simple to use utility. Watch 4 Folder 2.5 - a folder monitoring and automation utility that can monitor up to 4 different folders simultaneously for 12 kinds of events and react for each event with different kind of actions. It can also react for each event with different kind of actions like writing to a log file, display different kind of messages or executing a program, batch or script. W4F can also return the changed object (file, folder, etc.) as an argument to the executed program batch or script so you can predefine automation process for this object, for example you can monitor a folder for new files and when a new file is created you can print the new file or move the file to a different location, open it with a program you want or any other manipulation you need. 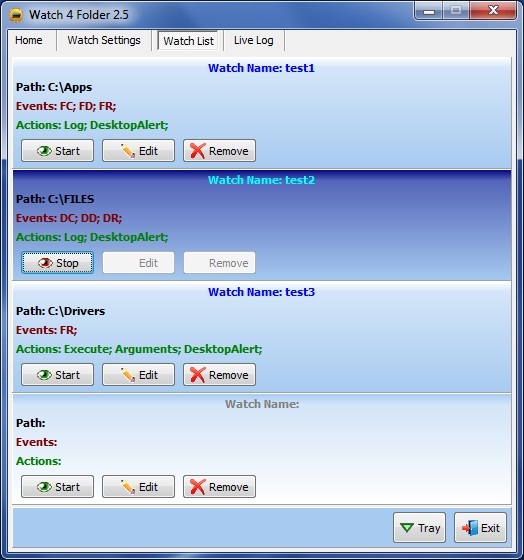 The program maintains a live log that logs every event, action or settings changes. W4F can run in the background from the system tray and use minimum resources and can auto start with different configurations using command line parameters. • Free version – this version is limited to a single folder monitoring, which means you can monitor only one folder at a time, this version if free to download and use with no other limitations. The free version is distributed as portable app without installation and can be moved and executed from a different location or different computer. • Registered version – this version let you monitor up to four folders simultaneously. The registered version is distributed in a single ZIP archive file without installation, it is portable and can be moved and executed from any location on the same computer, but can't be executed from a different computer (registration is per machine). does this run as a wingows service? This is a great tool. Thanks. But it seems does not work in following situation. I have a php script which create file to a specific folder. I set it up to monitor this folder, once a file created, it should run a batch file. If I copy a file into the folder, it works. But if the file is generated by php web application, it does not work, the batch file cannot be triggered. Do you have any suggestion about how to make this work? Thank you very much. W4F uses Windows Shell Notification API to identify events. If for some reason the OS doesn't report a change, W4F can't identify it. W4F is based on a Windows Shell Notification API, this API doesn't report when a file is closed (or free). You will have to execute a batch or script that will run in a loop and check to see if the file is locked until it will be free. BTW as you already have an example of using your software to trigger an Email / Attachment creation here is another example. user email address, then I trigger another freeware program which creates a pdf version of the jpg scan. I actuallly use the 2 step Gmail security verification and it works ( application based password ). It all seems to work and your utility plays a core part of the implementation. Feel free to use this on your site as another example of using your Utility. start /min c:\sendmail\sendEmail -f @gmail.com -o tls=yes -t @gmail.com; -s smtp.gmail.com:587 -xu @gmail.com -xp "abcdefghijk" -u Automated_Doxi_document_process_for_file_%1 -m Sent_von_Doxi_Computer_file_%1 -a %1 -l "sendemail.log"
If you have a folder that you need to monitor for new files and you want to send the new file as attachment by email (outlook only), here are the steps to do it. Create a batch file and name it whatever you want. "C:\Program Files\Microsoft Office\Office11\Outlook.exe" /a %1 /m "&subject=Scanned Document from youremail@youremail.com&body="
Replace the subject text (Scanned Document from) with the subject text you want. Replace the email address (youremail@youremail.com) with your address or any address you want. Select the folder to monitor. Check the "File Create" monitor event, this will monitor the selected folder for new file creation. On the Action panel, check the "Execute a program or batch file" checkbox. Browse and select the batch file you just created. This step will set W4F to execute your batch file when a new file is created. Check the "Add changed object as argument" checkbox. From the arguments drop list, select the first one "File Create – File Name" and check it (round check box). This step will set W4F to return the new created file name as argument for the batch file (represented as %1 in the batch). Now you can click on "Start Monitor". When a new file will be created inside the monitor folder, the new file will be attached automatically into a new email message with your subject and address. I'm very interested in this utility, but i'm curious if this will also work with subfolders. For example, the source folder will have subfolders created within it with files inside of it, and the subfolders would then need to be created on another terminal and the files copied within. I'm not sure I understand your needs, but you can download the free version and try it. W4F can monitor activity in sub-folders also. I purchased a registered version. Is it possible to monitor more than 4 folders? The only thing you need to do is to click on Apply button. the settings are saved in a settings.cfg file, to find the file in the temp folder, click start > run and enter %temp% and press Enter, an explorer window will open, locate a sub folder named W4F25, the settings file is inside, it is a simple ini file. make sure you have the needed rights to the temp folder. I am using version 2.5.1, windows 7. This doesn't work... only file change even works in my scnerio instead of file create but file change event is triggred 4 times each time a file is synced in dropbox. Can you pleas help how to get file create working or file change trigger only once and avoid recurring events on a dropbox sync? 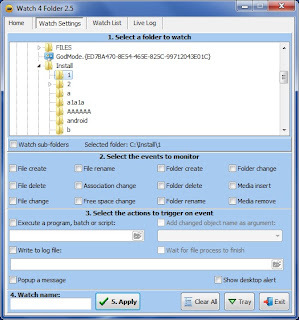 Watch 4 Folder can't be used to monitor any kind of network drive. The results will be unreliable. I have a folder w/2 files in it. One a .mdb other a .txt. Want to monitor only .txt file changes, copy newly changed .txt file into a subdirectory either date/time or add date/time to name of file. Any suggestions? W4F can't monitor a single file. You will need to keep the txt file in a different folder. I found Watch 4 Folder yesterday and I use it for customer of our Company. The log which be saved by the program is good but I miss an option to see which employee has done something with a file or a directory. Is it possible to activate such an option? Or is it possible to code it into a newer version? Thank you for using my software. This is not a small change in the code or an option to activate. It is out of the scope for now, maybe in the future I will work on that. Can you point me to the situation when the error occurred ? Is it something I can simulate ? Registered version is only for one computer? Samba-Server "File create" tool no detecte a new File. W4F doesn't work with network folders. How can it be started to the system tray? Look for command line options. you have wonderful software like Watch 4 folder, i got difficulty to implemented on windows xp, the program cannot run well, i watch for new file on the folder but it seem the shell notification not running, its stuck/idle condition. do you have any idea to solve this? Windows XP should not be a problem. I need some more details to solve your problem. Is it a local folder or a network folder you are trying to monitor ? Did you run W4F as admin ? are you the machine admin ? Does the monitor starts ? Hello, does anyone know how to configure W4F to automatically print a PDF file? For Step 1, why I can't browse into C:\Users\MYNAME\AppData\Roaming... (Windows 7) I precise I can display hidden files/folders from Windows Explorer but W4F (free version) can't do. Also I don't have found the solution to enter the full path. Please help me! will be appreciated. You need to read the user guide or watch the demos on YouTube. I can see that you don't know how to use Command prompt parameters, which is very simple. To refer the first object you use %1 the second object is %2 and so on. W4F will return sometimes a single object, like when a new file is created the file name will be returned to the batch file and will populate the %1 var. In the case of rename of a file W4F will return two file names, the original file name will be %1 and the new file name is %2. My advise is to find on Google some explanation on how to work with batch files and vars. Currently W4F can't monitor or display hidden folders. I will add it on the next version. I am trying to auto start W4F using task scheduler. However, W4F does not have a way to retain the configuration after user sign out. Is there any other way to do this ? Yes it does save the settings, it saves the settings for each user. I found the configuration file and saved the configuration I need on a 2012 server. However, it doesn't seem to monitor the file when I ran it from the task scheduler. W4F is not a service, it will not run when the machine is in log-off. I managed to configure task scheduler to start the program. There is an option in the task scheduler that instruct the task scheduler to run the specified program disregards of whether there is a user logged in or not. Task scheduler also prompted for log in password when configuration is saved. In fact the program did run as I can see it in the Windows Task Manager process details list. I am however not able to see the log file being updated. I used the same W4F configuration that I tested working when I manually run the program. I saw the active flag in the setting.cfg file is set to 1 when the "Start" button is clicked. I therefore copy the setting.cfg file with the appropriate setting and active=1 to the location accessed by the program when started in Task scheduler. I assumed W4F will first check for an existing seeting.cfg when started and start monitoring automatically when the Active=1 is set in the .cfg file. Please advise if this is correct. Appreciate it if you can help explained how I can make sure the correct setting.cfg file is read and the monitoring is started automatically without requiring clicking on the Start button. I am willing to share the configuration steps when I managed to get this working properly with your approval. Thank you very much for the help given. I Don't know what you are trying yo do... but you don't need to do all this settings editing and so. You don't need to touch any settings file or to edit any file. It will be better if you will read the user guide, you can find there how to auto-start W4F with different settings. If something will not work for you, please be more specific and give me more details, like what exactly you are trying to monitor, where is this folder, etc. I am configuring the program to auto start after server reboot using windows 2012 Task Scheduler. I used the command "w4f.exe -all -m". The program was started when I checked on the Task Manager. The folder being monitored is a simple data folder created for testing purpose. Does it works when a user is logged on ? It doesn't work as long I used the Task Scheduler to run. There is no problem if I launch the program manually either from cmd or double-clicking. W4F is a desktop application, it will work only when a user is logged-on. Hi, I can not set up a program to monitor a folder "C:\ProgramData" in Windows 7 x64. It is possible to adjust somehow? Thanks for help. Every time I start this program the settings is gone and I need to add them again. How to make them stick after a reboot? it is a simple INI file. The settings are saved automatically, so if they are not saved I guess something (like a protection app) clear the temp folder or prevents from writing to this location. Love the application, but one problem I'm having. I have it monitoring a folder for a new file then executing a bat file. If I copy a pdf into that folder, everything works. if I scan a document and the scan creates the PDF in that directory, I can watch the file being created, but the application doesn't see it. As wrote before a few times, the app is based on a Windows API for shell change notification, if the OS reports a change then WF4 will "know" about it, if not it will not trigger W4F. I am attempting to see if the Blog is still active. I posted a comment a few minutes ago but I cannot see it. I want to monitor folder for file changes, then if file changed restore it with archived one. But program creates infinite loop as replacement is monitored as another file change. 1. File Zvika.txt has content "I like Watch 4 Folder". 2. File has been changed by external factor with the content "I don't like Watch 4 Folder". 3. Your program reacts to this change then silently extracts SelfExtractArchive.exe which contains original txt file with "I like Watch 4 Folder". 4. Here comes infinite loop. How to avoid step 4? Is there a way to add some 1-2 seconds pause where your program will not react? W4F will always react to changes. you need to set a check in your scrip or batch, maybe check for MD5 before you command to replace the file. Correct, please read the user guide. I downloaded the program to try it but it doesn't look like it is monitoring anything. To test I just clicked file create and selected the local path. Looking at the Live Log, nothing happens when I move files to the folder. In another attempt, I specified an action of launching notepad when a file is created, and again nothing happened. What am I missing? Yeah, I have done that. I would think it is polling the folder to be monitored? If so, is it possible to set the polling interval (e.g.to 5 minutes) in order to reduce/minimize network load when monitoring a network folder? W4F doesn't support network drives or folder, it is a local desktop app. It doesn't do any polling, it is registered to receive a notification from Windows on specific folder or file events. This is great tool thank you ! I only face a little issue, I hope it can be fixed. I monitor a local folder and its subfolders on a server, it works great when I modify files directly on the server. But it does not monitor when a file is modified by people accessing the folder through a network shared folder (from another machine), is there a way I can monitor that? No, W4F doesn't support network activities. How can I get the old and new file name on the file rename event from DOS command line ? Sure, %1 and %2 represents the old and new name. More info inside the user guide. If I own two computers, I'd need to buy two copies? Ive noticed that every time windows does an update the settings file gets wiped, and I have to put all settings back in again which is very time consuming. The program wouldn't loose all settings 2-3 times a week if you will not delete your temp folder 2-3 times a week. Just backup a copy of the files inside. I don't know why you or your update procedure is deleting this files.